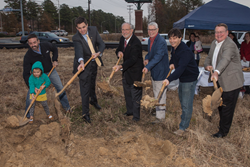 Mugshots Grill & Bar broke ground yesterday in Ridgeland, MS to mark the start of the construction for the 2015 spring opening. "We couldn't be more excited about bringing the Mugshots brand to Ridgeland." Mugshots Grill & Bar announces the ground breaking for the 2015 opening in Ridgeland, MS. McMath Construction of Mandeville, LA broke ground yesterday with plans to open in the spring of 2015. "It's an exciting time for the Mugshots brand and family," said Mugshots Grill & Bar COO, Chris Banchero. "We're extremely excited about taking the Mugshots brand to the Ridgeland area and becoming part of the local community," Banchero also stated. Mugshots hosted its groundbreaking ceremony yesterday, Tuesday, December 2nd, at 3:00 P.M. to announce franchise owners Jennifer and Clint Walker and the plans for the 2015 opening on Lake Harbour Drive. "We couldn't be more excited about bringing the Mugshots brand to Ridgeland. We look forward to serving the community and spreading our 'Havin' a Good Time' culture," said local franchise owner, Clint Walker.